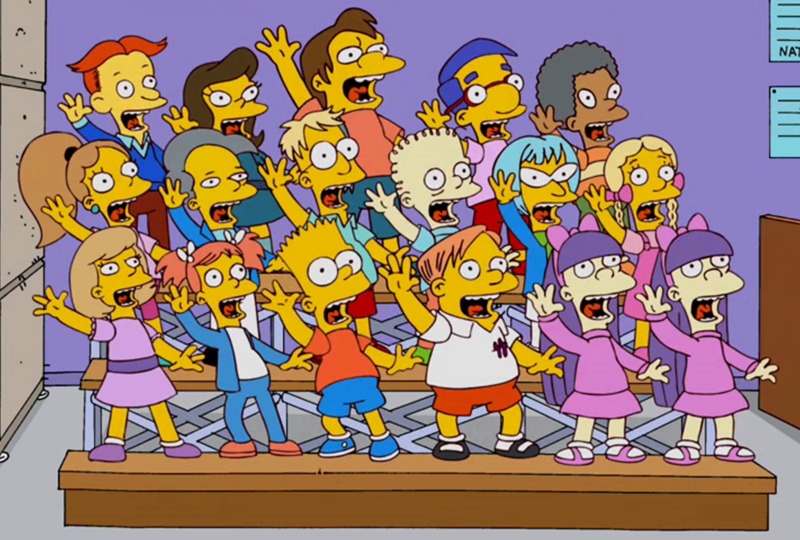 The Fourth Grade at Springfield Elementary School is Bart Simpson's class. It was taught by Ms. Krabappel (until Season 25 episode, "The Man Who Grew Too Much", due to the death of Marcia Wallace). Most of the kids are 10 years old. In one episode there are only 16 seats in Ms. Krabappel's classroom. Two seats in the front row are taken by Ishmael and Ezekiel, while the other seat to Bart's right is reserved for the new student, Samantha Stanky. At one point, Jimbo Jones and Kearney Zzyzwicz are shown sitting in Ms. Krabappel's class. However, they are sixth-grade students who frequently cut class and ditch school. It is possible that they were present in the classroom to redeem something they failed in the fourth grade, or for some other similar reason. One of Bart's classmates greatly resembles Levi Bernstein, one of Bart's distant cousins from the Bernstein family side of the Simpson family tree. Following Marcia Wallace's death (the actress who voiced Edna) and Krabappel's retirement, it is currently unknown who teaches the class as the classroom has never been shown since Jack Lassen's brief term as teacher. Modified on March 3, 2018, at 10:26.